The Bering Strait, the Arctic waterway between Russia and Alaska, is known as the "Marine Mammal Superhighway." It is also rapidly becoming a popular route for more than just polar bears, walrus, whales, and seals. As climate change melts Arctic sea ice, this waterway--like others across the region--is seeing a marked increase in shipping traffic. Because shipping can significantly affect ecosystems, WWF is taking action to ensure that development in the Arctic occurs in an environmentally and socially responsible way. 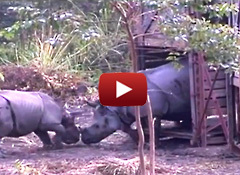 On the edge of Ujung Kulon National Park--the only place in the world where the rare Javan rhino exists--you'll find Asep, a father of four, working to rehabilitate the forest. Asep didn't always have the stability he enjoys today. He fled his village in 2001 due to political unrest, leaving behind his home and rice fields--15 years of labor, lost. Today, the future looks brighter. 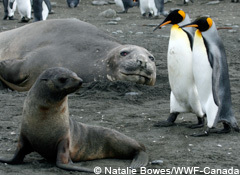 Enter the WWF Photo Caption Contest and your creative caption could be featured in next month's e-newsletter. "You told me this was a formal event!" Marc B., New York, N.Y.
Alaska's Bristol Bay is a national treasure. It's the ecological epicenter of the Bering Sea, which yields more than 40 percent of the wild-caught seafood produced in the U.S., and an irreplaceable stronghold for fish and wildlife. But right now its future is at risk. The largest open pit copper and gold mine in North America is proposed at the headwaters of Bristol Bay. If developed, the mine would destroy miles of salmon streams and acres of vital salmon habitat, and would require up to 10 billion tons of toxic mine waste to be stored and monitored "in perpetuity." Urge the federal government to protect Bristol Bay from the potentially disastrous Pebble Mine. Carbon emissions from aviation are polluting our skies at a staggering rate. They are projected to nearly double by 2030 and continue to climb unless we can adopt new, international policies to get them under control. Secretary of State John Kerry has the opportunity later this month to slash this pollution by supporting a global agreement to reduce the aviation industry's carbon emissions. By taking a leadership role on this critical issue, he would demonstrate to the world our nation's commitment to tackling climate change in the U.S. and across the globe. U.S. Activists: Urge Secretary Kerry to support a global agreement to clean up our skies. Have you ever wanted to see a mother polar bear and her cubs, or a huge solitary male polar bear, ambling across the tundra? Here is your chance! In honor of 40 years of conservation work to secure a future for polar bears, WWF is giving away a Classic Polar Bear Adventure for two, courtesy of our tour partner, Natural Habitat Adventures. Come face-to-face with the world's greatest concentration of polar bears on a six-day tour in Churchill, Canada. Sign up for a free webinar at 3 pm ET on May 21 with Dr. Sybille Klenzendorf, managing director of WWF's Species Conservation Program, to learn about polar bear conservation. Natural Habitat Adventures staff will also discuss the experience of seeing wild polar bears. No purchase necessary. Open to legal residents of the 50 United States (D.C.) 18 years or older. Ends 6/30/13. To enter and for official rules, including odds and prize descriptions, visit www.worldwildlife.org/sweepstakes. Void in FL & where prohibited. Basics: Black-footed ferrets are about 18 to 24 inches long and weigh up to 2.5 pounds. The ferret is entirely dependent on the presence of prairie dogs and their colonies for food, shelter and raising young. 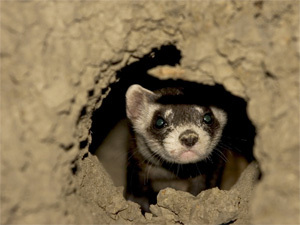 Threats: Black-footed ferrets are one of the most endangered mammals in North America. 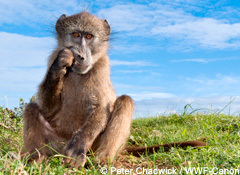 Habitat loss, reduced prey populations and nonnative disease threaten the recovery of the species. Interesting Fact: In 1987, there were only 18 black-footed ferrets left on the planet. Thanks to the Endangered Species Act, which was signed into law 40 years ago today, and decades of collaborative conservation efforts by WWF, other conservation organizations, land management agencies, tribes, landowners and other partners, the population now stands at 1,000 ferrets in the wild. 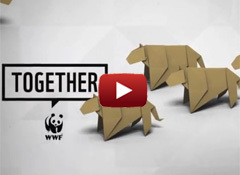 Thanks to New Headings' support, 20% from the sale of all of their WWF products is donated to WWF's conservation work. Check out New Headings' latest additions for spring, including Comfort Panda insoles, WWF messenger bag, Thermo Frost lunch bag, and the Panda Picnic Pack. Visit New Headings' Variety Center. 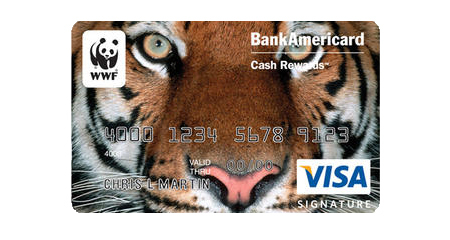 Show your love of the tiger with the WWF BankAmericard Cash Rewards™ Visa® credit card. Cardholders earn a $100 cash back bonus after qualifying transactions. Bank of America will contribute $100 to WWF for each new qualifying credit card account. Get more details. The human body has more than 600 muscles. How many muscles are in an elephant's trunk?